A nine hour drive west of Kansas City is Tucumcari, New Mexico. It’s about the only town between Amarillo, Texas and Albuquerque, New Mexico, and it is just the right distance for us to spend the night. 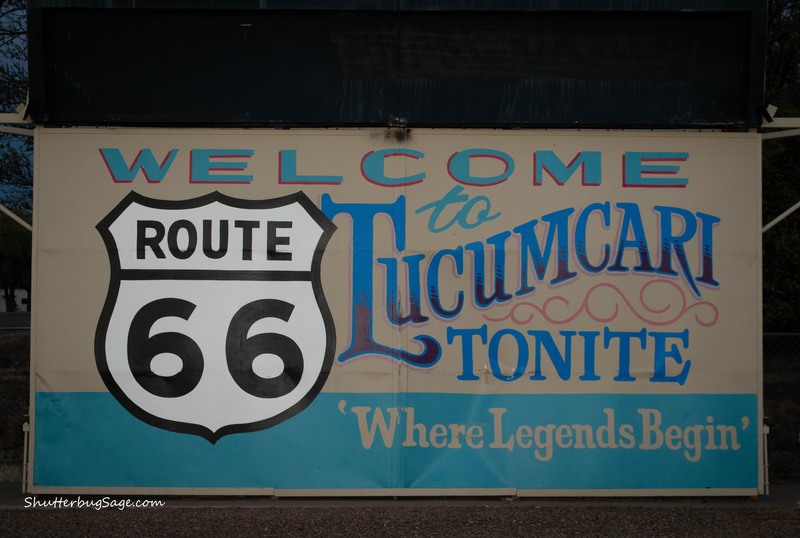 From the beginning of Route 66, the “Mother Road” from Chicago to Los Angeles, Tucumcari was promoted as a stopping point for the night. 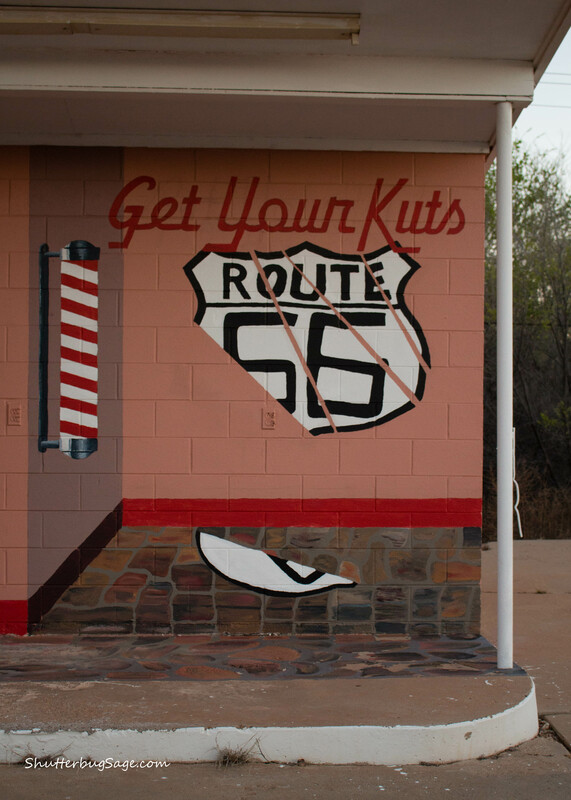 Like many of the towns that were forgotten when Route 66 was replaced by I-40, Tucumcari has its fair share of abandoned buildings in various states of decay, but it also has some pretty amazing murals thanks to former Tucumcari resident, Doug Quarles. 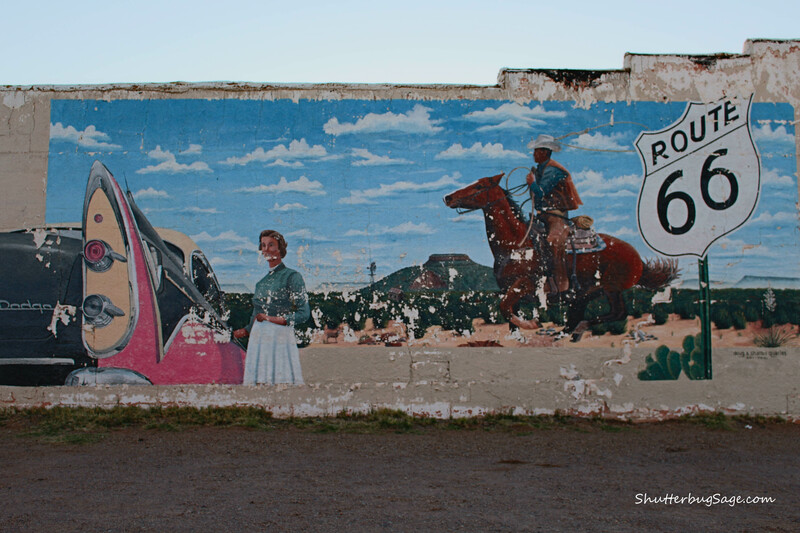 In the 10 years that Doug and his wife, Sharon, lived in Tucumcari, he painted 40 murals to help revitalize the town. 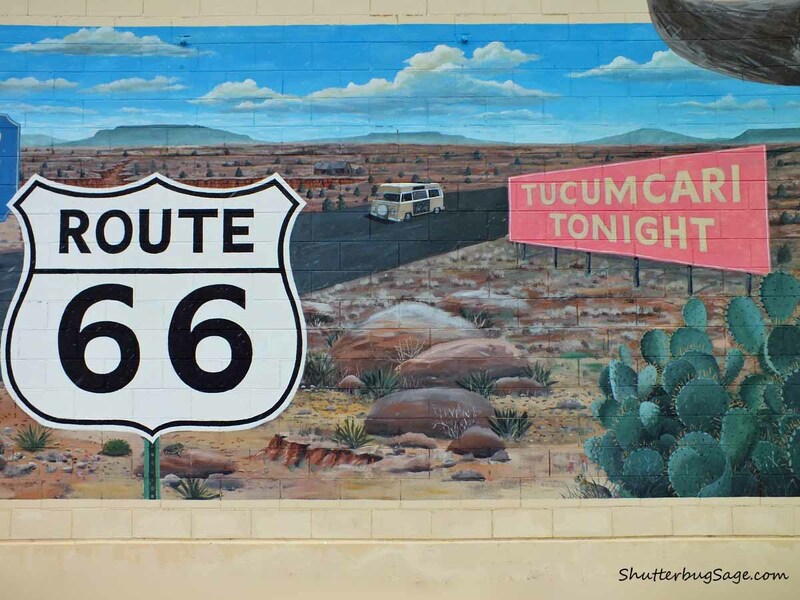 The Tucumcari Chamber of Commerce publishes this map listing about ten murals, but if you look hard — down side streets, in parking lots, and even some businesses — you’ll find many more. 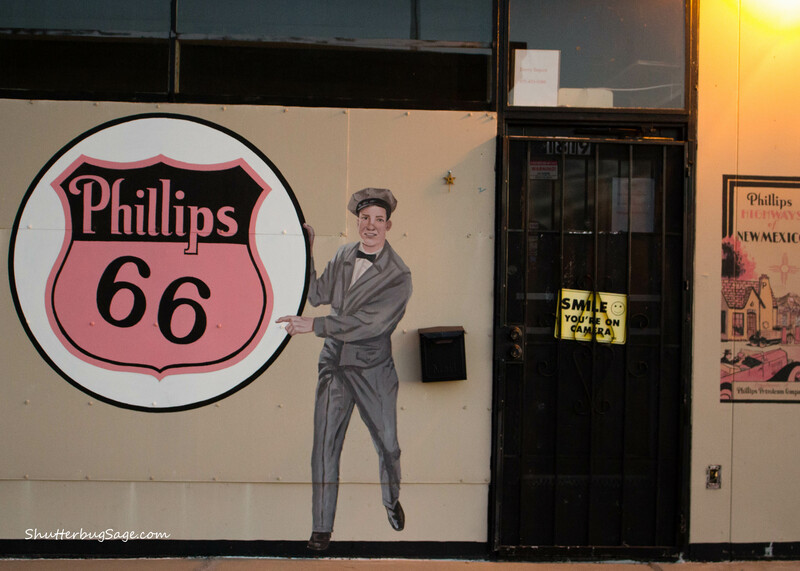 Running from Chicago to Los Angeles, Route 66 is approximately 2,450 miles long. According to The Route 66 Guide, you can drive the entire highway in two weeks, but really should allow a full month. Guess what else I’m adding to my Bucket List? Route 66 crosses 8 states and 3 time zones. The states that the “Mother Road” runs through are: Illinois, Missouri, Kansas, Oklahoma, Texas, New Mexico, Arizona, and California. 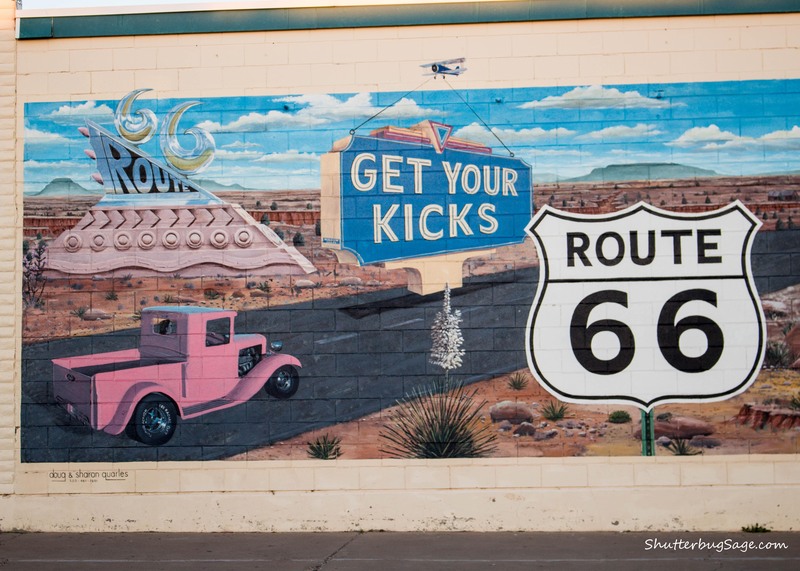 Written by Bobby Troup in 1946, the song “Get Your Kicks on Route 66” has been performed by several musicians including Nat King Cole, the Rolling Stones, and Depeche Mode. 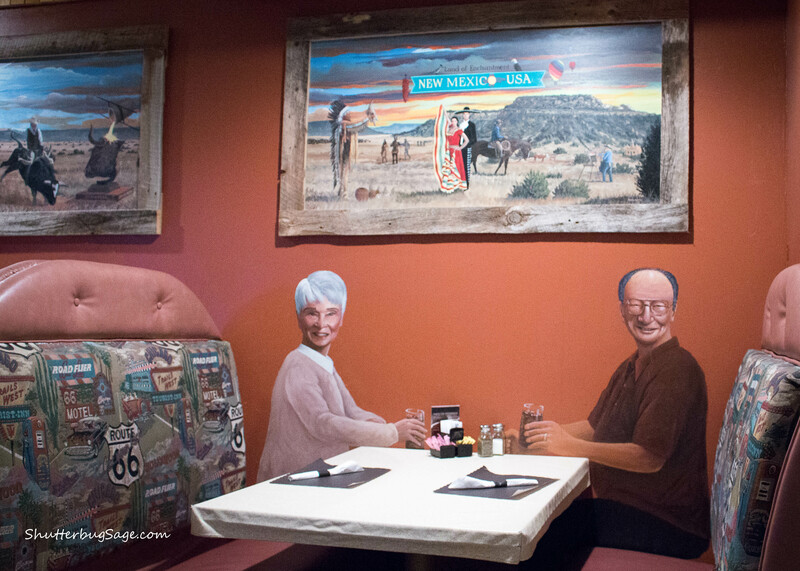 The Pow Wow Restaurant and Lizard Lounge is chock full of murals, including one at each of the booths. As I was enjoying my stuffed sopapilla dinner (which I highly recommend), the man depicted in the mural at our table walked by and said hello. I’m not sure what upkeep is needed to maintain the murals of Tucumcari, but when I think of the murals that make up the East Side Gallery in Berlin, I know that many of them were recently restored. Some of the Tucumcari murals are starting to show their wear, like this one in a parking lot along the main drag.